To coordinate and lead the deployment process and follow-up the 2nd Strategic Plan of the University of Cádiz. To promote collaboration among all members of the community of the University to achieve the goals of the 2nd Strategic Plan. To organize and to perform technical coordination of the management team. Follow-up the Governing council guidelines. 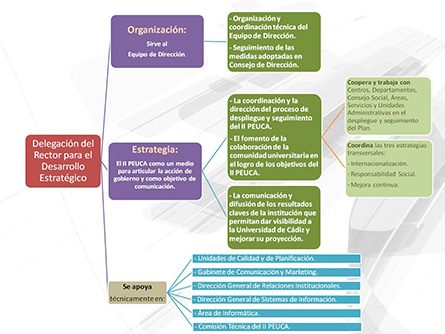 Follow-up the processes and key results allowing to promote the University.